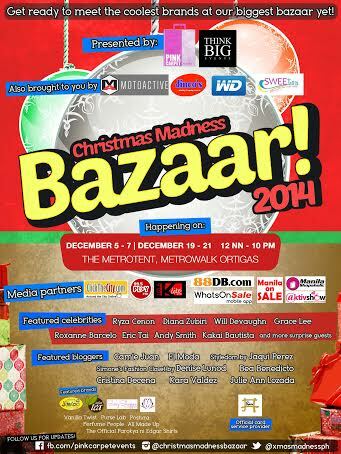 Get ready for an ultimate shopping experience as Pink Carpet Events proudly brings you one of the biggest bazaars this holiday season: Christmas Madness Bazaar 2014. Now on its second year, Pink Carpet partners with Think-Big Events to showcase some of the finest holiday finds from over 100 established and upcoming homegrown retailers, online entrepreneurs, and celebrity/fashion bloggers like Diana Zubiri, Grace Lee, Will Devaughn, Roxanne Barcelo, Ryza Cenon, Eric Tai, Kakai Bautista, Andy Smith, Camie Juan, El Moda, Denise Lunod, Jaqui Perez, Bea Benedicto, Cristina Decena, Kat Valdez, Julie Ann Lozada, and more surprise guests. Some of the featured brands include Jamaican Pattie, Infinitea, Vanilla Twist, Perfume People, Kayleigh Boutique, Guelora, The Official Parokya Ni Edgar Shirts, Purse Lab, Postura, All Made Up, Chic Mode and SissyShoppe. Bring your shopping bags with you from December 5-7 and 19-21 at the Metrotent Convention Center, Pasig City and spend your last-minute Christmas shopping with us for a ticket price of Php 100. This year, the Christmas bazaar will also highlight three sections: The Main Hall, the Tailgate Bazaar section, and the Food Fiesta. The Main Hall will house products from a wide variety of lifestyle, fashion, arts and crafts, sports, and IT stalls. Targeted more towards male shoppers, there will be a Tailgate bazaar at the outdoor area, with sellers offering accessories, apparel, kicks, and gear, and selling them straight from their vehicles’ trunks. You can also find great food choices at the Food Fiesta set up near the entrance of the tent. Raffle prizes and promotional deals will also be given away by the event sponsors and featured concessionaires every hour on the hour. Expect performances by some of the country’s top acoustic artists, and enjoy exclusive playlists curated by 103.5 K-Lite and 99.5 PlayFM. Use the Rafflecopter widget below to submit your entries for this giveaway. Please enter/use a valid email address as we will be using e-mail to contact our winners.